A hallmark of the Worricker Trilogy is the captivating quality of David Hare’s writing. “Pressure like whiplash does not exist” is a good example. As every schoolboy knows both whiplash and pressure do exist. Yet we the viewer are told it does not and for a brief moment we become nihilists and believe him. The conundrum; namely, how something can exist and not exist at the same time is the hallmark of the brand of British spy fiction that John le Carré’s Smiley series turned into the political action/thriller genre to which I am most attracted. Before le Carré, authors of espionage novels presented us with good guys and bad guys. James Bond was a good guy. A hero. The ones implausible Bond was licensed to kill were bad guys. This was axiomatic. 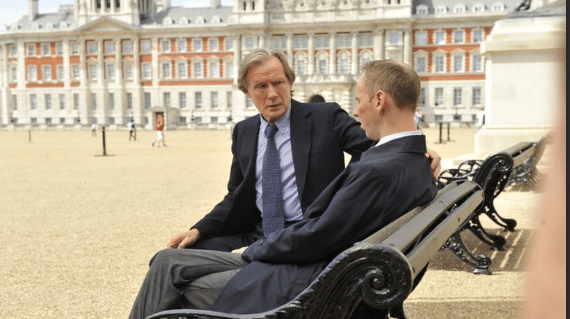 By comparison David Hare’s Johnny Worricker (played by Bill Nighy) is an anti-hero who left his wife when she became pregnant. Despite Johnny severe character flaws (or perhaps because of them) we are nonetheless sympathetic to Johnny’s continual questioning of a world where the good guys do bad things; bad guys do good things. Concepts like good and evil (much like pressure and whiplash) are presented as mythological. For me, this brand of existentialism bordering on nihilism consistently has been compelling. This is the way to hook me as Johnny Worricker and his Dickensian colleagues, lovers, enemies and friends did. From frame to frame The Worricker Trilogy stops time with its presentation of a world that appears to be true. Verisimilitude serves as catnip for me. I am the kind of person who craves catnip given my personal circumstance. Yesterday, when I watched the series from start to conclusion without pause, my objective was distraction to the point where I no longer felt relentless pain–a consequence of surgery for kidney cancer. As with Ralph Fiennes’ ability to transfer pressure and whiplash from the real to the non-existent, the realization of David Hare’s words was entirely successful. Previous PostTranscript of my preliminary hearing where the Court found enough evidence to try me in Commonwealth CourtNext PostAt Rittenhouse Square, in love then, now, and forever with Leah, Jean Shepherd, and….